Landscape painting was one of the most popular genres in seventeenth-century Holland, and Jacob van Ruisdael, who was born into a family of famous painters, was undoubtedly its greatest exponent. Despite the fact that its compositional structure displays great maturity, the landscape here was produced early in the painter’s career and reflects the influence of Jan van Goyen, Hercules Pietersz Segers and Hendrick Goltzius. The perspective is perfect, and the lower-than-usual skyline gives great prominence to the sky. 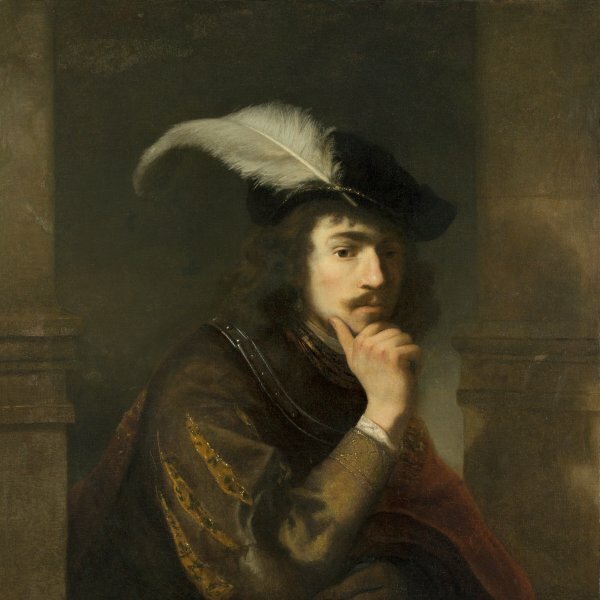 The use of light and chiaroscuro also echoes the work of Rembrandt. Jacob van Ruisdael is considered the greatest Dutch landscape painter of the 17th century. A prolific artist, he depicted a wide range of types of landscape throughout his career, from panoramic views, dunes, marine views, forests, mountains, waterfalls and rushing streams, all of which are frequently found in his work. Van Ruisdael’s compositions skilfully combine a monumental conception of the landscape with a detailed approach to individual elements within the natural world. His views, which do not always depict a specific geographical location, are deliberately adjusted to achieve an eloquent, striking effect without distorting the realistic depiction of the various elements within them. Van Ruisdael’s brushstroke, which is precise and elegant, is applied in a vigorous, heavily impastoed manner, giving his works an emotional drama not to be found in those of his contemporaries. View of Naarden may have been in the collection of Richard Grosvenor, 2nd Marquis of Westminster and have remained with the Grosvenor family for several generations, from the second half of the 19th century to the first quarter of the 20th century. It was then on the UK art market, subsequently appearing with the Matthiesen gallery in Berlin, from where it was acquired for the Thyssen-Bornemisza collection in 1928 or before. Van Ruisdael may have depicted a view that had sentimental associations for him, as his grandfather moved to Naarden around 1590 and both his father and uncle Salomon were born there. This small, horizontal-format panel is signed and dated 1647, thus corresponding to the artist’s earliest period when Van Ruisdael was around eighteen or nineteen. His first known works, a group of around thirteen oils, are generally dated to one year earlier, in 1646. Despite the artist’s youth, his approach to the compositional structure reveals considerable maturity, being organised around a sweeping, panoramic view despite the small size of the panel. In order to achieve these effects, Van Ruisdael lowered the horizon line and placed much of the emphasis on the sky, which occupies more than half of the pictorial space, as we find in other works by the artist. 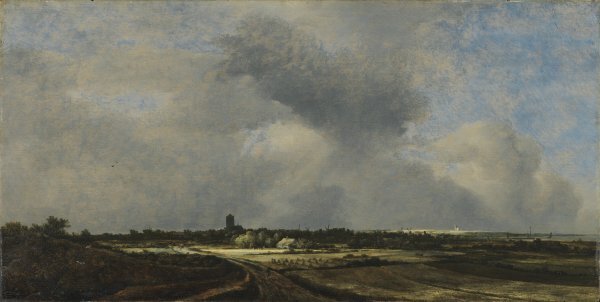 Compact areas of clouds with patches of intense blue sky are arranged in alternating zones, through one of which the light filters onto the ground in a rhythmic play of lights and shades that create the spatial recession of the broad plain with its various fields, paths and clumps of trees. This carefully considered and organised landscape reveals the influence of other painters close to Van Ruisdael whose style was important for his own at this early date. Among these influences, the most important are those of Hendrick Goltzius, Hercules Segers and Jan van Goyen, whose works included panoramic views in horizontal format in which the sky is a particularly important element. The use of light, which creates an intense glow in the centre, followed by zones in dark shadow surrounded by others in half-shadow, as seen in this painting, was a method used by Rembrandt in the 1630s and 1640s, as Simon noted.The form of the city on the horizon seems to be influenced by the work of Hendrick Vroom. In the centre of the painting, located among the cultivated fields and houses, is the city of Naarden with the ZuiderZee on the right and the ruins of the church of Muiderberg illuminated in the distance. Two drawings of the city of Naarden have been related to this composition, revealing a number of similarities although they differ in other aspects. The drawing in Darmstadt has a low viewpoint and shares a number of features with the present panel, including the treatment of the sky. However, in the drawing Van Ruisdael omits the hill that introduces the eye into the painting at the lower left corner. The second drawing, in The Hague, has been re-touched by a hand other than the artist’s. It does not include the ZuiderZee on the right, as seen in the present panel. 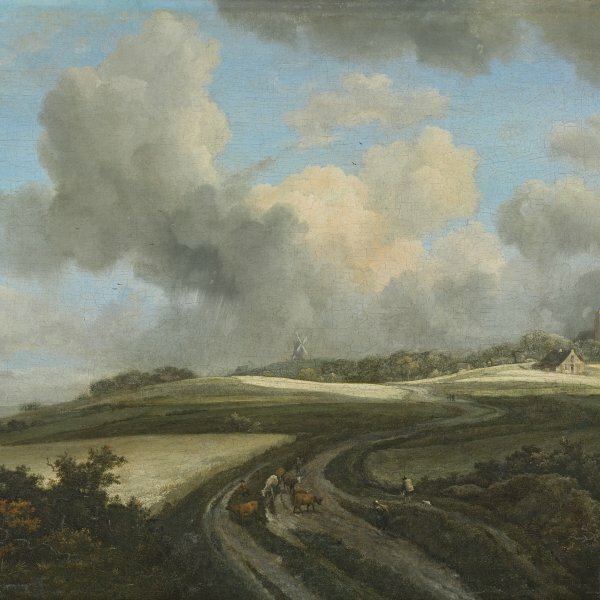 The present painting can be considered a “view” of a typical Dutch sky with cumulus clouds.